I grew up spending every summer at a family cottage on Lake Freeman in a small Indiana town called Monticello. It was there that I was surrounded by the most unique musical influences possible: aunts, uncles, and a cousin of every age from birth to mid-twenties. Growing up in the 80s meant that Mellencamp had a steady presence on our dock and boat as we blared his music from our “boom box.” We were so proud to belt out his tunes and even more proud knowing he was from a small Indiana town, just the like one we were in! Mellencamp’s existence faded a little bit from our playlists throughout the years, but made a huge comeback through my living room television, courtesy of VH1. My best friend from a block over ran all the way to my house one day so we could wait for the video of “Wild Night” to come on. We had heard it on the radio and knew the video would be just as exciting. She had always been a Van Morrison fan, so the Mellencamp version was easily a hit in our catalog. We found the CD in a brother’s collection and listened to it constantly. As we spent the next few years dancing along to all of Mellencamp’s music videos as they were released, our other musical tastes slowly began to take over again. It wasn’t until my graduation from high school in 2000 that I really began my journey of hope that I am still on today. My graduating class threw our caps in the air as “Small Town” (our choice) blared from the football field speakers. I was a few months shy of heading to IU Bloomington and was ready to absorb Mellencamp’s music to the fullest. 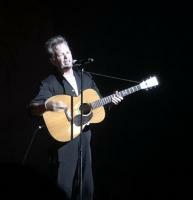 Once on campus, it didn’t take long for the Mellencamp influence to kick in, as he was doing his “Good Samaritan” tour and “popped up” in the middle of campus for an acoustic set. The next summer at Deer Creek I saw him perform “Peaceful World” and other songs off of Cuttin’ Heads. I was soon enrolled in the “History of Rock N Roll” class on campus and became completely enthralled with music. I had been listening to Cuttin’ Heads prior to that, but mainly “Peaceful World” found itself on repeat daily, especially after 9/11. After tragedy struck, the song suddenly meant so much more than it had before and somehow managed to soothe the sadness as it talked about paving the way towards a Peaceful World. It wasn’t until our professor (Glenn Gass) spoke passionately about having bought a Bob Dylan record as a teen, taking it home and then lying on the floor while listening to the record in its entirety that I was ready to embrace music in a different way. He told us that if we could find a record that spoke to us from beginning to end, then it was truly something magical. Eager for such an experience, I hurried back to my dorm, put in my Cuttin’ Heads CD and listened to it from beginning to end, lying on the floor. I was immediately moved by the title track, cried at the story it told and was thankful that there was finally music to describe how passionately I had always felt about ending racism. That was it, I was hooked for life. I went on a mission to buy and listen to every Mellencamp CD I could find. Suddenly, all the songs I had sung along to in the 80s took on whole new meanings and expressed exactly how I had always felt. Who knew those rock anthems were packed so full of deeper meaning?! I couldn’t listen to a song without dissecting it to friends, a habit I had gotten from doing so in my History of Rock N Roll classes. I became somewhat of a musical preacher, with Mellencamp’s words filling the pages of my Music Bible. In 2003, I met Zach Dunkin from the Indianapolis Star and spoke at lengths with him about the impact of Mellencamp on my life. He enhanced my fondness for Mellencamp even more by loaning me copies of old taped interviews, filling my curious mind with endless Mellencamp stories, and having me read the book, American Fool: The Roots & Improbable Rise of John ****** Mellencamp (I try not to use the “C” word). We talked crazily about “To Washington” when it came out and we were so supportive of and excited about the song—neither of us ever understood how small-minded people could be in letting this song turn them off to Mellencamp. At that point I couldn’t get enough of the magic that was John Mellencamp and was practically bursting at the seams with Mellencamp fever. 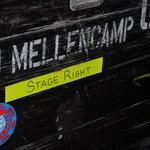 While at IU I had never run into or seen Mellencamp anywhere in Bloomington, as had everyone else (or so it seemed). After my graduation in May of 2004 and a summer spent in Monticello, I decided to spend another year in Bloomington in hopes that I could absorb everything the town had to offer (outside of being a student). I planned to sit in on some of the History of Rock N Roll classes, wait tables and take in as much of the music scene as I could. Sadly I discovered a month or so later that my dad was losing his battle with lung cancer and I needed to be at home. That same day I received an email saying that I had been chosen to see Mellencamp perform at the Buskirk Chumley for a show on A&E. It was scheduled for the night before I was to move back home. After all those years on campus of taking in his music I would be leaving town on the words and music of John Mellencamp. Upon my return home I spent the first few nights excitedly talking about the show I had seen on Kirkwood. As I sat in bed with my dad everyday for his last two months of life, music was often a part of our discussions. You know how “born-again Christians” feel the need to talk about God constantly to anyone that will listen? Well that’s exactly how I became with my dad- Only I was a “born-again Mellenhead” - I felt the need to send my dad to heaven with the wisdom of Mellencamp. I wanted him to know how moved I was by the words that came from John’s mind and the music from his guitar and band. I didn’t want my dad to worry about the world he was leaving his family in because I believed in the power of the words Mellencamp sang. I would quote Mellencamp’s songs about racism, equality, a better world for the common man, and so on. To this day I still continue to be a preacher of Mellencamp’s words. I run a gas station for boats on the same lake I grew up on and have pictures of Mellencamp on the walls of the store. All of my customers know I’m a huge fan and I am thrilled when they ask me why I like Mellencamp’s music so much. I tell them to go home and listen to “Rain on the Scarecrow,” “Cuttin’ Heads,” “Love & Happiness,” “Jena,” “Peaceful World,” “To Washington,” etc… and then tell me they don’t feel like they want to change the world and quite possibly can. I am forever grateful that I was introduced to John Mellencamp’s music at an early age and allowed for it to shape who I am today. I briefly met John outside of the Crump Theater show that I was so blessed to have been chosen to attend. While I had thought long and hard for years what I would say to John if I had ever met him (any number of the prior mentioned stories were on that list), I simply said hello and asked him to sign my Scarecrow CD booklet-hoping that one day, in some parallel universe I would be able to sit down with John and discuss all the thoughts he conveyed in his music…I never wanted an “Oh my god, I’m talking to John Mellencamp and I’m going to ramble on about how obsessed I am” type moment, because that’s not what it’s about (I save that sort of reaction for when I see him on stage and am screaming along to every song). It’s more about absorbing the lyrics and sharing them with those who have yet to hear and know their power. The Crump Theatre show definitely surpassed any expectations I had. Having been chosen through the fan club, I assumed family members and friends of the band would be up close and perhaps we’d be lucky enough to squeeze into the theater (I had watched the A&E Live By Request Bloomington show from the back of the theater-literally standing in the doorway the entire show and I was prepared for a similar spot at Crump). Instead I was thrilled to be ushered to the front of the theater where I found the perfect seat in the center of the third row. And just when I thought I couldn’t be luckier—Mellencamp not only gave us (the audience) permission to take pictures during the concert, he encouraged it-- whether the TV crew liked it or not!! I had dreamed of the day I would be able to take my professional camera into a Mellencamp concert and actually be allowed to take pictures!! 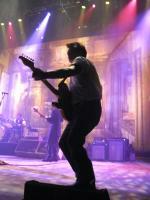 One picture I had snapped at the Crump Theatre was of John dancing during the instrumental part of “R.O.C.K. IN THE USA” – he even looked right at my camera! Never in my wildest dreams would I imagine that two years later, in Bloomington, Mellecamp would pull me up on stage to dance with him, but that’s exactly what happened! Having not seen him perform in Bloomington since my last night there back in 2004, it was a bittersweet moment. My journey to Mellencamp that had really taken flight when I first stepped foot on IU’s campus in 2000 had come full circle at the IU Auditorium on October 29, 2010. 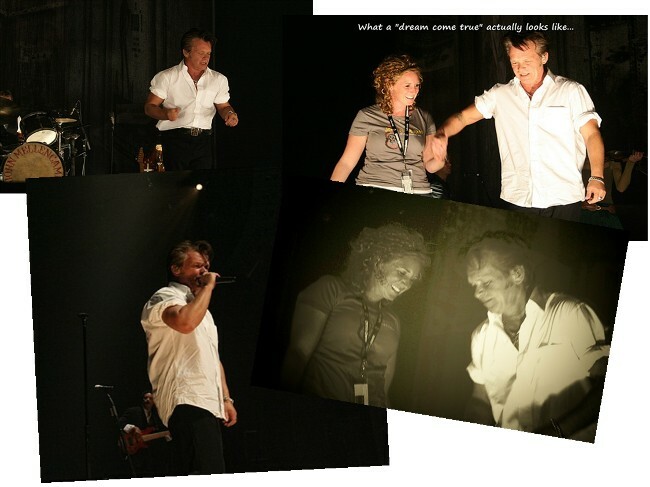 While I still very much have the desire to actually meet and chat with Mellencamp one day, I will always treasure the memory (and pictures…and video) of the moment a true American icon (and my idol) held out his hand and invited me on his stage for a quick dance. This “essay” of sorts came to me shortly after the Crump Theatre show. That show had filled me with so much energy and passion towards the words and music of John Mellencamp that I needed to put all that into my own words. I wanted others to look at any of the pictures I had taken that night and feel the exact same way I do about Mellencamp and his music. Somehow in looking for a way to describe my feelings, I found myself on a musical journey as I traced back to where it all began…a tiny boom box blaring a Mellencamp anthem during a hot summer in the eighties. Check out Susan dancing with John! Thank you for sharing....just reading your 'essay', it gives me goose bumps. It is so cool to hear how Mellencamp and his music can have such profound effects on each person differently. What a great read. Thanks, I enjoyed it. Susan, I've seen you at a couple of shows since the IU show that night & have wanted to say hi but haven't had a chance! Your story had me in happy tears at the end...such a wonderful story! Really, full circle, and amazing! I hope that your Mellencamp journey continues to go on, and that you continue to have more stories to tell, and that you continue to share them with us! And next summer when we are up at Indiana Beach, I'm going to bring my kids and husband by your gas station to see your pics and maybe we can chat a while!!! I just ran across this. Susan, thank you for sharing your story! To say it is touching is an understatement. Beautiful. That is a great story! I enjoyed reading it. Thanks for sharing! Simply awesome, Susan...thanks for sharing this wonderful story and journey!!!!!! Wowser, wonderful read...made me feel like I was right there with you throughout your experience...lovin' it!! thanks for putting into words how so many of us feel. now you need to update it, especially after Belmont! Thank you for the 'essay'. Very good read, and moving. I enjoyed reading about your experiences and wish someday to be able to meet John. This is such an incredible read, Susan! You are a great writer- but most importantly, I can FEEL and UNDERSTAND the EXACT feelings you've shared with us. I'm only a 16 year old girl, but seriously, I LOVE and PREACH the words of John Mellencamp DAILY. I feel as if that the messages he writes in his songs are so important that they must be heard all over. And I try to show other kids my age the glory and talent of John Mellencamp's music, and I read them his lyrics word from word. I try my hardest to get them to understand and appreciate John's music, but they just don't seem to listen and understand. I seem to be the only young person who truly appreciates and takes John Mellencamp's words and music to heart. I have not been a Mellencamp fan nearly as long as you, since I was only born in 1999. But I have been a fan for a while and I can't tell you how much I can connect, reflect, and LEARN from his music. I absolutely LOVE learning new things from his music. While I do find my education important and I try my very, very best in school- I find that the most important life lessons and rules have not been learned in school or even at home, but right in John Mellencamp's music. His music "plainly speaks" true words of wisdom and understanding that every person, regardless of age, needs to hear! I had the honor to see John live too, but I only got to see him one time. It was just this past June, and I had something similar happen to me like what John did to you. He did not bring me up on stage with him, but he did grab my hands THREE times! And he smiled and winked at me over 100 times- okay I swear I was counting how many times he winked but I lost track! (I was also getting lost in his sweet blue eyes! Ahahaha!!!) But it was SO INCREDIBLE! He even spoke to me right before he sang, "Cherry Bomb". I remember the whole thing- he knelt down right in front of me, smiled, and started to talk to me... and I could barely remember at the time what he said because I was so mesmerized by his smile!!! My jaw completely dropped... it was the best night of my life, hands down. As mentioned above, I have a strong, emotional attachment to Cuttin' Heads since it was the first CD I got of his. I wrote him a letter shortly after the concert, and I sent the CD cover with the letter, requesting for his autograph. And guess what? I got it back!!! He signed the CD cover and he read my letter! It meant SO MUCH to me that I cried the whole day- and then I bought an expensive frame for it- and now it's sitting right beside my bed on my nightstand so I can see it every morning and night. And EVERY single night, I kneel down beside the autograph, and I smile and I say, "Thank you, John. Thank you." And then I make a wish... one wish every night before I go to bed. And that wish is to meet him. My lifelong wish and goal is to meet John Mellencamp! Every birthday, I close my eyes and imagine myself having the honor to meet him- and then I make that wish and blow out the candles. I want to meet him so badly. So, SO badly, and I can't express how much I love him as a person and as a musician! 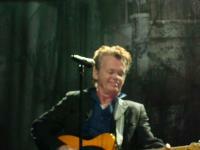 I may be "positively crazy", but gosh- I would do ANYTHING to just spend even ONE minute with John Mellencamp. So I can tell him that I'm trying to get my generation to appreciate his music and I just want to give him a great, big hug and thank him!!! How lovely to see such passion amongst John Mellencamp fans from all walks of life. What a great read, thanks for the shares, all of you. John's a masterful rock legend and an advocate for the 'people'. His lyrics resonate in such a powerful way that do touch us, and give us voice, and remind us that there is a witness to our lives who will not let us be forgotten. God bless you John.